Starring�Joseph Runningfox.�This true story of epic courage and grace is a remarkable window on Native American life. Unprovoked, the Mexican Army swept through an Apache camp slaughtering old men, maiming defenceless women and torturing their children. Among them, the wife, the mother and the child of young brave Goyahkla. Channelling his grief into retribution he led a retaliatory strike and emerged as Geronimo, natural leader and tactical genius. This true story of epic courage and grace is a remarkable window on Native American life and the early years of the last and most feared Apache War Chief. The Apaches` defiance in the face of the U.S. and Mexican Armies resulted in their numbers being decimated. in I867 the remaining Apaches were rounded up and relocated to a reservation. But the stifling life forced Geronimo to dash for freedom. After eluding a military force of 5000 for 18 months Geronimo finally surrendered to the government after securing a promise that his people could go home. instead they were deported to Florida as prisoners of war. 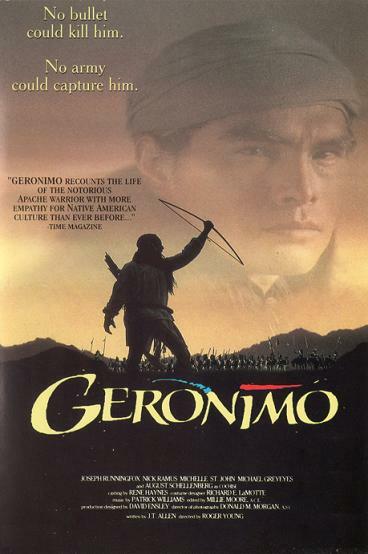 Geronimo died on February l7th l909, never again having seen his homeland.